When the history of the recent restoration work on St Mary's comes to be written (and there's another project waiting to be done!) I think it will record that the Autumn of 2001 was when "things really started to happen". Since the last newsletter, so many of the things which were at that time only plans and hopes have now become a reality. In this newsletter I'll bring you up to date on developments in the church, and take a look at what the current plans are for further work to 'care for and maintain the church' as set out in our constitution. First of all though can I draw your attention to the enclosed minutes of the Annual General Meeting of the Friends held, by kind permission of Seymour and Louise Aitken at Brook House in November. This was the first formal occasion on which the members could hold to account (and re-elect if so decided) the committee that has been organising and recommending expenditure of money raised by the Friends. It was a welcome opportunity to validate what the committee is doing, and get suggestions and share discussion on projects that the Friends should be taking forward. It seems such a long time ago now, but let me start with the flower festival on 7th -9th September which was a resounding success. Financially it contributed some £2,500 towards the Friends funds, but perhaps even more important was the goodwill generated in the community, and the number of people who came to visit our lovely church from all around the area. The church looked beautiful. Ever since it was set up in 1998 the Friends has been supporting efforts to improve the heating system in the church. One of the earliest meetings received the news that heating engineers estimated we had only about one quarter of the heat output required to adequately warm the church for services. Its been a long time coming, but we finally have a system in place. At the time of writing, the new gas-fired boiler has been installed in the space below the bellframe in the church tower, and hot air ducts that will distribute the warm air into the church nave have been fitted. The gas supply for the boiler has been laid across the churchyard and brought in through the base of the south wall of the tower. To complete the system grilles will be fitted to the ducts, and a low screen will be added to the existing screen at the base of the tower chamber to hide most of the ducts from view. All that is needed is for the gas supply to be checked and switched on by our gas contractors and we should be ready to go -a little later than we had hoped, but in time for what are usually the coldest months of the year. As part of the work to bring a new gas supply into the church, it was necessary to run a narrow, shallow trench along the edge of the existing patch that leads from the gate to the church porch- it then swung round to reach the base of the church tower. At the same time a second narrow trench, designed to allow installation of a safer more modem electrical supply was needed around the base of the North chapel. Works such as these in an archaeological important area such as the churchyard are a vital way of allowing archaeologists to gauge what might lie below the surface -not a detailed investigation, but a sort of lifting of the edge of the carpet as it were. In the archaeological trade, these are referred to as 'watching briefs'. As part of the arrangements for installation of the heating supply, the Historic Churches Committee required a watching brief on the two trenches. As a former field archaeologist, I was happy to be able to undertake this work. The results were not surprising -no need to call in the Time Team yet! -but provide some useful pointers for future research work in the area, should the opportunity arise. 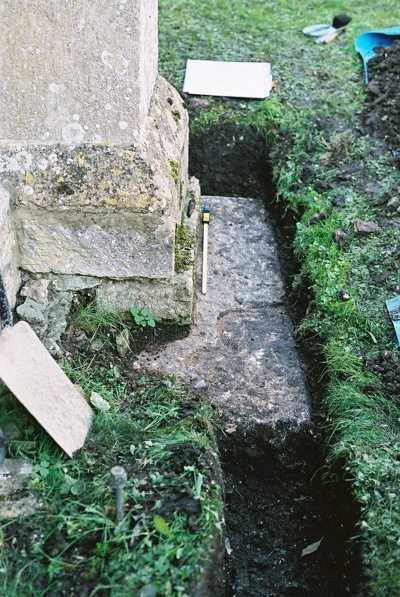 The trench alongside the North chapel foundations uncovered a large rectangular limestone stone slab built into the foundations of the buttress at the north west corner of the chapel. This was last exposed during archaeological investigation of the area in the 1960's. The dimensions (1.27m x 0.59m x 0.18m thick) and the moulded edges of the stone led researchers at the time to suggest that this stone was part of an earlier altar from the church, removed -possibly as part of a 16th or 17th century re-ordering of the interior -but kept as part of the church, buried in the foundations. Clearly, the shape and size of the stone are more than would be needed to support the foundations, and the stone has definitely been used elsewhere, but during my examination I did not see anything that would confirm this interpretation. I enclose a photo -what do you think? The trench to the South of the church uncovered a layer of gravelly sand, some 15cm (6") below the ground. My guess is that this is the remains of a dump of building materials from a previous major restoration of the church -perhaps the 1862 work. Not surprisingly, this trench also uncovered a number of human bones. These had not come from burials - the line of the trench had been planned to avoid all known burials, but they were loose in the topsoil of the burial ground - not unusual in view of the number of burials (several thousand) that have been made in the churchyard. I am grateful for the assistance of a colleague from English Heritage, Martin Newman, who came out to identify the bones. Unfortunately (or perhaps not?) I can't report that we found the body of Bill Peare - the highwayman who was apparently buried in the churchyard in an unmarked grave in 1783! The bones, once examined, were all re-interred in the churchyard next to the church porch following a short ceremony led by Fr Richard. The churchyard boundary wall: work to patch and repair the 19th century wall is nearing completion. At the time of writing only the cap-stones on the wall need replacement. We hope later to be able to fund replacement of the railings. The lead lining of the font, for which funds were voted at the AGM, has now been finished. A tap to allow the draining of holy water from the font bowl has been added and it has already seen use - Jessica Hulme was the first child to be baptised in the restored font. Also to be funded by the Friends is work to install grilles to protect the 20th century stained glass windows - the East window dating to 1906 and the two on the South side dating from the 1940's. The wrought iron gateway and the arch above it are now being refurbished. As part of this, the step up from the pavement to the churchyard has been removed, and the churchyard path sloped to provide better access for wheelchairs and prams. The bell that will be used by the restored 19th century chiming mechanism was decorated and blessed during Mass on 2nd December 2001. The bell itself is 19th century, cast by one of the most famous bell foundries of the period, J. Taylor & Sons of Loughborough in 1876. It has a diameter of 15" and weighs some 80 Ibs. All being well it will be installed by the time you read this. At the time of writing the clock face has been taken down to be re-gilded, to complete work on the clock. One future project currently being talked through is the use of the North chapel which at the moment houses the late 19th century (c.1890) pipe organ, the confessional and storage cupboards. If we are to make better use of the chapel space, we will have to remove the organ. The necessary permission for this from the St Sampsons PCC has been obtained, but we are still looking for a smaller replacement organ, which could perhaps be accommodated somewhere in the nave of the church. Faculties to take forward what would be a substantial change to the church interior will be needed, and we are still at an early stage. This is an area where the Friends can perhaps act as a forum to ensure our architects produce a scheme which everyone can support. The Annual General Meeting started discussion on this, but if you have opinions and ideas that you would like to contribute, please do get in touch either through Gerry, Bernadette or Fr Richard. Planning has also begun for fundraising and social events for 2002. At present the Friends committee is planning a 'mini fete' for June (dates to be finalised) and we are also looking to take part in the 2002 'Heritage Open Days' scheme over the week-end 13th -16th September. It's never too early to start finding volunteers to help during the Summer on this or any other events, so if you can spare some time to help get things organised I'm sure Sean O'Connell and Peter Baister our events organisers will be happy to hear from you. And while we're thinking about fund-raising please remember to send in your annual subscriptions. For those whose subscriptions are due, a pink slip is enclosed with the details. And finally: I'm sure all Friends will be pleased to note the recognition of the contribution of this fine old church in a recent change to the official name for the local Catholic parish - from 3rd October 2001 the parish has been renamed the 'Parish of St Thomas of Canterbury Fairford, with St Mary Cricklade'. This group of dedication plaques in the church commemorate the charitable works of Major Henry and Elizabeth Smythe in the 1850's and 1860's. Two are on wooden panels, painted to resemble slate plaques on marble surrounds, while that commemorating the donation of the church clock is on a metal sheet in a wooden frame -a slightly unusual choice of material, which perhaps suggests that it was made by the same craftsman who made the clock dial. During the current works to install heating in the church tower they have been taken down, but they will be reinstated when the works are completed.